Kosumi is a Japanese go term adopted into English. It is often translated as diagonal or diagonal move. The kosumi is not yet physically connected but with locally alternating play it can not be cut: if White tries to cut at a, Black plays at b and becomes connected and vice versa. These two points are prime examples of miai. 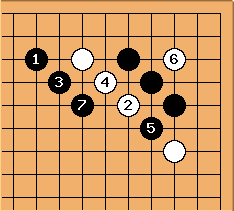 ... when White already has a stone here and is strong in the area, playing the kosumi is to be avoided. Some examples of this shape in actual cases are at compromised diagonals and joseki. Example of kosumis in pro game given in "NHK Igo Koza" magazine, September 2005. According to commentator Oya Koichi, "An exemplary fuseki through . The vital point of seems reasonable, and is a vital point as well, is then unavoidable, then ...wait a minute, what is this, it's raining kosumis! There's something natural about this particular kosumi shower, and it's hard to explain the difference between these and the so-called weak player's diagonal which is supposed to be bad." For diagonal contact there is a whole diagonal attachment path. Dieter: This is my interpretation of Rob van Zeijst's columns on the kosumi. An example is given there of hebo kosumi (weak player's diagonal). See Attach-extend on the side, tenuki: it's not a trite matter. I have now added quite a number of further pages stimulated by what's there, and discussion here.